Prepare your students for successful critical care nursing practice! 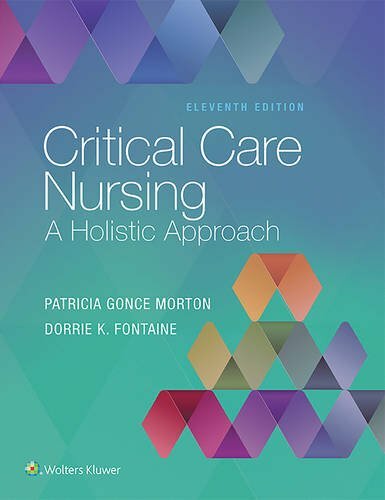 Focusing on preparing students to provide optimal care for critically ill patients and their families, this updated 11th Edition of Morton’s classic text integrates the latest research in health care and nursing education, while providing clear, concise writing; outstanding photographs and illustrations; and a holistic approach to the complexities of critical care nursing. By presenting theory and principles within the context of practical application, the authors promote critical thinking and clinical decision-making in every chapter and emphasize the patient as the center of the health care team’s efforts. NEW! QSEN icons signal pertinent content within the text. Updated Spotlight on Genetics boxesinclude important genetic information and summaries of selected genetic disorders. Updated Case Studies with Critical Thinking Questions guide students on the journey from knowledge to practical application. Updated Evidence-Based Practice boxesinclude excerpts from the latest AACN practice alerts and published research, helping readers understand the importance of research-based practice. Considerations for Older Patients boxes highlight the special needs of the fastest growing segment of our population. Patient Safety boxes guide safe and effective practice by alerting the critical care nurse to risk factors, signs and symptoms, side effects, and complications. Health History boxes summarize key areas to cover and relevant information that may be revealed during the health history. Collaborative Care Guides incorporate nursing diagnoses and emphasize outcomes and interventions based on teamwork and collaboration. Online student resources include short videos, animations, review questions, and much more. Lippincott DocuCare, a web-based educational EHR simulation software, available for purchase, further supports your students’ readiness for practice.